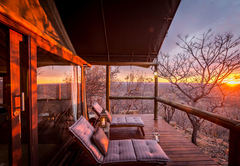 Bushwa Private Game Lodge is a highly recommended Limpopo game lodge providing a wildlife experience for discerning tourists visiting Waterberg. 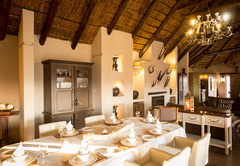 Set on 1000 ha in the unspoilt Waterberg biosphere this unique superbly stylish game lodge will not fail to touch your heart. 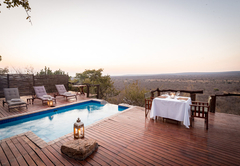 Bushwa offers a choice between a luxury Safari style tent, a romantic tree house, deluxe Spa room, or a bush camp which is available on an exclusive basis and is situated in the middle of the bush where hyena, jackal, porcupine and other night animals can be spotted. Only 250 km from Johannesburg. 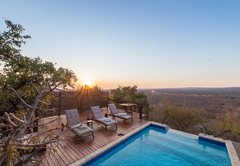 Step into tranquil luxury at Bushwa Safari Tented Lodge with unspoilt views of the majestic Waterberg and waterholes frequented by giraffe, kudu, eland, gemsbok and a great variety of water birds and a breeding pair of fish eagle. 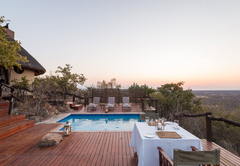 Four luxury Safari style tents set high on a hill, each with their own private deck, percale linen and four-poster beds, romantic en-suite bathrooms and outdoor stone showers all with breath-taking views. Watch the sun set from the splendour of your own deck or laze on a daybed at the pool enjoying a sundowner. Excellent cuisine prepared by the in-house Chef in the elegant dining area or a starlit dinner around the campfire will restore your soul. 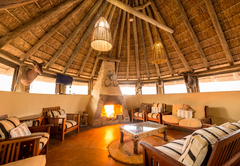 A special Bush braai can be arranged at the bush boma where you can experience the sounds of the bush while enjoying a real traditional braai under the stars. 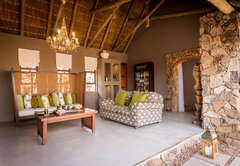 Set in the heart of the bush, stylishly decorated and ideal for family gatherings, birthdays, corporate functions/ conferences and intimate weddings - sleeps up to 20 people. Full catering can be arranged on request. The camp offers 5 bedrooms all with queen-size beds, 2 tented chalets with queen size beds and a sleeper couch in each chalet, loft room with 6 single beds, boma where you can enjoy a meal around the campfire, conference and a big entertainment / games room, bar area and heated pool. 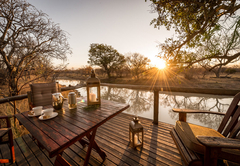 Set on a waterhole, a real unique experience for the nature lover where the rustle of leaves will soothe you to sleep. 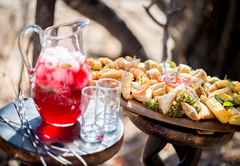 Book a picnic basket and relax alongside the river watching the very diverse birdlife in the Waterberg. All meals are served at Safari Lodge. At both lodges guests will be able to experience Rhino tracking on foot as well as guided game drives and walks amongst a host of animals. 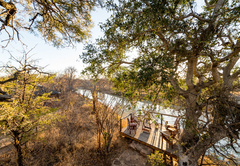 Relax at Bushwa Private Game Lodge's, Tsamma Bush Spa, where nature’s unspoilt beauty and peace will refresh your soul and strengthen your inner being. 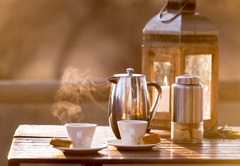 All meals; game walks & drives, teas & coffees. Drinks, all items of a personal nature, any item not described above. It was a great experience! 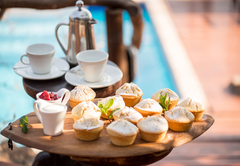 The staff went beyond what is expected to make our stay special. The food was delicious. 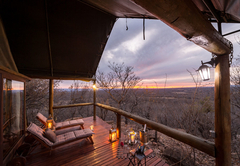 The views from the luxury safari tents are spectacular. Thanks to everyone at Bushwa. We will visit again. This place is just stunning! Hidden away in the bush and so luxurious! We we greeted and offered a welcome drink,we were made to feel at home right away. The service was very personal and we were asked what we wanted to do and when ie.Game drives,luch,dinner... We were taken to the treehouse where we would spend the first night, when I stepped into this treehouse I could not believe how luxurious it was and so well furnished and decorated. We were even greeted by a hot water bottle in our bed! We were woken by the sounds of waterbuck eatign just downstairs from the treehouse,what a wonderful and unforgettable experience! Wait to see the surprise you get after returning from a game drive!!!!... Food was 5 star, we were served a 3 course meal which was absoloutely delicious from start to finish. 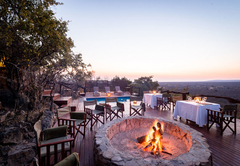 The deck at night is so romantic,with the boma fire lit and all the stars you can see. The safari tent rooms are luxurious and comfortable,beautiful big bath and outdoor shower for the adventurous. I could go on for ages... Annamarie the owner was a wonderful and caring hostess,eager to please in every instant. And of course her wonderful family who run the business. The staff is friendly and helpful. What a stunning weekend I will definaltely return again soon! Excellent Excellent Excelllent!!!!!! 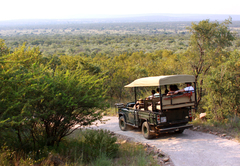 Response timeBushwa Private Game Lodge typically responds to requests in 5-10 minutes.